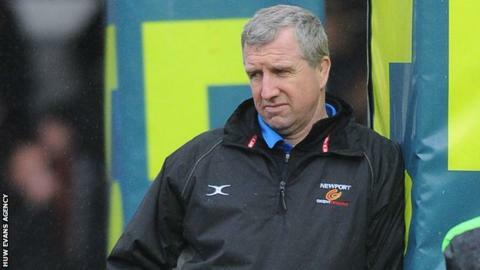 Director of Rugby Lyn Jones has promised a summer overhaul of Newport Gwent Dragons' style of play. The region will finish bottom ranked of Wales' four teams in the Pro12 for the ninth consecutive season. Jones took over in June 2013, and described his inaugural term in charge as a "milestone". "We're totally restructuring how we are going to play and how the Dragons are going to approach rugby for Wales in the future," said the ex-Wales flanker. "That's all going to start in June." Jones arrived from London Welsh having previously been an assistant Dragons coach and been in charge at Ospreys. The Dragons began the regional era by finishing third in the Pro12's predecessor - the Celtic League - in 2003-04. In that season five Wales teams finished in the top six of the competition. A fourth place followed in 2004-05, but since then the Dragons have ended no higher than seventh in the table, feats they achieved in 2009-10 and 2010-11. The competition structure itself has changed with the winners now decided after a four-team play-off. This season it will be contested by Leinster, Ulster, Munster and Glasgow. Treviso - who are battling for a place in next season's European top flight - will come to Rodney Parade on 10 May. The Italian club lie bottom of the table, but level on points with rivals Zebre, going into the final round of regular season fixtures. Zebre travel to Glasgow on the final day of the season in which all games kick off at 18:30 BST. If Zebre and Treviso win, 10th-placed Dragons would finish bottom of the table. "It would be nice to finish off on a victory, but this season is a milestone for Gwent Dragons rugby," said former Neath and Llanelli player Jones. He added: "The players.... want to finish off with a bang at Rodney Parade by beating Treviso. "We know that they have a big play-off against Zebre for European competition, but we are not interested in that." The Dragons will go into their final game of 2013-14 on the back of a 34-23 defeat at Scarlets. Jones said: "We are interested in doing ourselves proud and playing the type of rugby we want to be proud of next year. "At the moment it's not pleasant, but we need to be focused and understand this is what we are and we'll be a lot better next year."